For the past eight years, Little Linksters, with the help of some of the game’s biggest names, have been on an annual quest to find some of the best little golf swings in the world….and boy have we found some good ones! The annual event has traditionally taken entries from November through mid-January and announced winners at the Annual PGA Merchandise Show in Orlando. 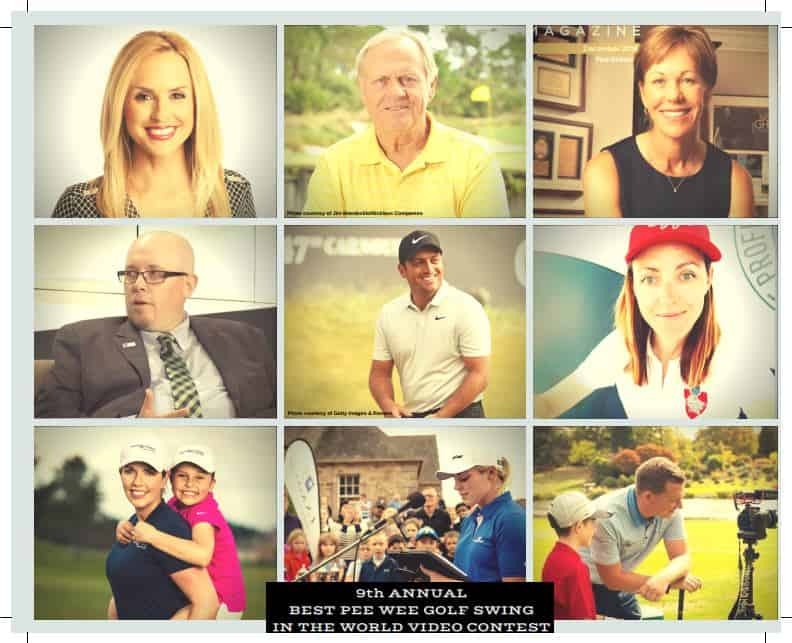 Past celebrity judges have included: Jordan Spieth, Jack Nicklaus, Gary Player, Lydia Ko, Brook Henderson, Lexi Thompson, Paula Creamer, Keegan Bradley, Lauren Thompson, Annika Sorenstam, Andrew “Beef” Johnson” and many others! Recent Golf Essentials Podcast episode with Brendon Elliott, PGA hosted by Casey Bourque discussing the International Pee Wee Golf Swing Contest. The purpose of this contest, as with everything Little Linksters does, is to have fun. This contest is proof positive that golf, among the youngest of golfers, is alive and well and we want to celebrate this by showing the world your child’s swing! We understand that with any contest, individuals will be very excited about the chances of winning but please keep in mind that all of the kids are winners by having a club in their little hands at such a young age! Keep in mind, this is a game and just so happens to be one that can be played for a lifetime…with all this in perspective, enjoy making the videos with your little ones and as always, enjoy the time with your family! As with all of our previous years, we will have an amazing prize package for each winner. Prizes will be announced at the March. For purposes of expediting the prize shipping process for our division winners, shipping charges may be required in some circumstances. Note: In celebration of our GOALS program for youth with Special Needs, and in the spirit of inclusion, we will pick a GOALS Division winner in each age group going forward. Golf is for ALL and has no limitations!! Little Linksters is a 501c3, NonProfit organization. The costs associated with this FREE contest have long been absorbed by Little Linksters. We encourage all who enter to make a tax-deductible donation to help support Little Linksters in their mission. Donations are private and secure and have absolutely no bearing on the outcome of the contests final results as the judges will not know who and who has not made a contribution. The judging period is open from Monday, January 14 and will go on through Sunday, March 24th at 12:00 midnight Eastern Standard Time (US). There are no exceptions to this. The preliminary cuts down to the final 12 videos in each age group are made by Little Linksters staff. Those that make the initial cut will then move on to our celebrity judging panel for selection. Winners will be notified prior to the official announcement of the winners which will take place on Masters Sunday 2019 at contest sponsor, The Littlest Golfer Inc.’s Headquarters in Savannah, GA. This will be done via Facebook Live, on the Little Linksters Fan Page. Winners will not be allowed to share the news of their win until after the official announcement is made. Failure to do so could result in disqualification. Morning Drive’s Lauren Thompson is back again! PGA President Suzy Whaley joins us! makes his fist appearance as a judge!